At their own pace, using their senses, the four and five year olds in the Holy Name pre-k program are learning, all the while thinking it's just plain fun. Through active play and exploration, the fertile minds of preschoolers will blossom. Your child will learn new things, solve problems, develop a sense of creativity, learn to work with others and independently, and learn to experiment. We pride ourselves in providing a fun, safe, and nurturing learning environment for a child's first school experience. The children have computers, physical education, music, art, and Spanish. 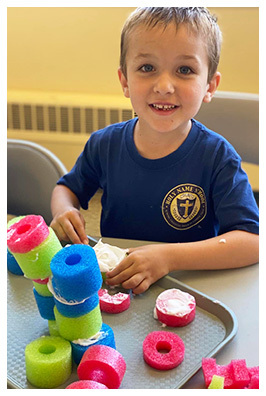 Curriculum is based on meeting state and diocesan learning outcomes while meeting the social, emotional, and developmental needs of young children. We provide teacher directed large group instruction using music, movement, and great literature. Children are also engaged in a variety of small group play and learning areas within the classroom that meet their social and educational needs, and tie into the monthly curriculum theme. Some of the highlights of our program include a state-of-the-art playground equipment area, field trips to an apple orchard/pumpkin patch in the fall, fire station visit during Fire Prevention Week, Breakfast with Santa, imaginary Polar Express ride with a visit from Santa, Cat-in-the-Hat visit along with other special guests in coordination with the nation's Read Across America event that honors Dr. Seuss' influence on literacy, and an English tea party to culminate a unit on nursery rhymes and fairy tales with a special guest visitor for the month named Paddington Bear. We also plan multi-generational activities with other classes and with our families. Some of these activities include grandparents' bingo, 100th day with the 7th grade, and Catholic School's week. Pre-Kindergarteners should wear the Holy Name School gym uniform every day except on scheduled monthly birthday dress-up days posted on the school's monthly calendar. Check back soon for important announcements! Talk and listen to your child as you do daily activities. Encourage your child to develop specific language skills, such as following simple directions or telling a simple story in the right order. Take children to the library, and choose books together to read at home. Keep books and writing materials where kids can reach them. Sing songs and listen to music. Encourage children to do things for themselves when they are ready.